Given the media exposure (and popular YouTube videos) of patients getting their "bionic ear" turned on with subsequent tears of joy... there is an often mistaken belief that such bionic ears, otherwise known as cochlear implants, provide superior hearing compared to an ordinary hearing aid. 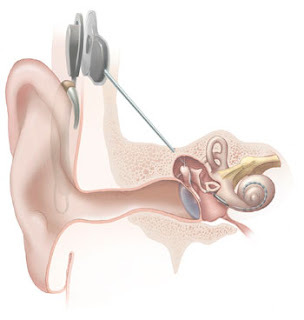 A cochlear implant is actually implanted through the skull and directly into the cochlea rather than placed on the outside of the ear (watch video). Well, this blog article will try to prove to you that such bionic ears actually provide TERRIBLE hearing quality, but when a person can't hear at all (even with a hearing aid)... something is better than nothing. Dr. Philip Loizou at the University of Texas Dallas has produced audio simulations to allow normal hearing people to get an idea what patients with cochlear implants actually hear. As background information, cochlear implants come in different sized electrode arrays and can be variably inserted into the cochlea. The following audio clips were taken from Dr. Loizou's webpage (please check it out!). As you can see, a cochlear implant provides a far inferior hearing sound quality compared to an ordinary hearing aid if you still have some hearing capabilities. However, if you are deaf or have such bad hearing that even with a hearing aid, speech is unintelligible, a cochlear implant can provide improved hearing to point of speech understanding, but far from normal hearing. Something is better than nothing! Read more about whether you are a candidate for cochlear implants here. Speech intelligibility as a function of the number of channels of stimulation for signal processors using sine-wave and noise-band outputs. Journal of Acoustical Society of America, 102(4), 2403-2411. Simulating the effect of cochlear-implant electrode insertion depth on speech understanding. Journal of Acoustical Society of America, 102(5), 2993-2996.